Portuguese and Real Madrid star Cristiano Ronaldo acquires a Gulfstream private jet for €19million. The current Ballon d'Or holder has been jetting around the world with business and appears to have bought his own aircraft for his journeys. He is tired of of the airline stress. 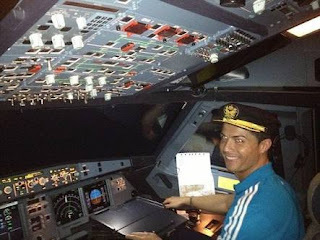 Pilot Ronaldo in his newly acquired jet. The 30-year-old is believed to have paid out €19million (£13.5million), equivalent to N5.7bn, on a new Gulfstream G200 business jet, to aide him fly around the world on his marketing missions. Portuguese tabloid Correio da Manha believe that Ronaldo has bought the luxury twin-engined aircraft and will have it kitted out with all the latest gadgets. The aircraft is of capacity of eight to ten passengers, depending on its specification. It has separate bathrooms for the crew and passengers, wardrobes, internet access, telephone, fax, microwave, electric oven, fridge and entertainment systems. The current Ballon d'Or winner enjoys jetting around the world when he is out of training with Real Madrid.